They are quite sociable as big cats go and it is possible to keep a group of these catfish in one tank. Three Lima Shovelnoses would do well in at least a 208 Litres (55 US G.) tank. This is especially true if all three are raised in the same tank together. Other tank mates must be chosen with great care. Large Cichlids could be experimented with, but should not be aggressive species. Large Plecos and other peaceful catfish would be great tank mates. Live fish will always be accepted and are easily weaned off of. Also pellets, tablets, shrimp, worms, and other meaty foods may be experimented with. 101.6cm (40") or 151-208 Litres (40-55 US G.) is suitable for small individuals under 25.4cm (10"). When full-grown, this fish requires a larger tank. 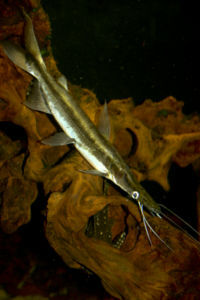 Like most catfish, the Shovelnose Catfish prefers shallow tanks. The tank should have large, open swimming areas. The tank should be dimly lit, with a cover of floating plants. Use large, sturdy, well-rooted plants. Small plants will be hopelessly buried or up-rooted. Provide sturdy hiding places with caves, rocks, or wood. Use fine gravel as a substrate. Lima Shovelnose's are surprisingly sociable for a large catfish and groups of them will happily coexist as long as their tank is large enough. This is especially true is you raise a group together. Dramatic looking fish with striking colouration of a dark brown upper body and brilliant white belly make these fish a favourite with many catfish enthusiasts. With an elegant, streamlined body these fish are designed for both speed and stealthy hunting.